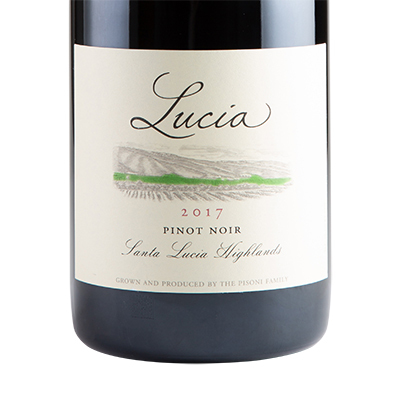 This Lucia Pinot Noir, reflects its harmonious blend of three vineyards: (47% Pisoni, 29% Garys’, and 24% Soberanes) in its deep garnet color. It begins by enticing the palate with ripe plum and raspberry, spiced cherries and black tea, and subtle notes of cedar and forest floor. As this wine continues to open up, it shows a complex palate of firm tannins and intense character. Like our single-vineyard bottlings, we use only free-run wine to develop the character of this appellation-based vintage. The three vineyards from which it has been created reflect the Santa Lucia Highlands’ diverse features, from the concentration of its mountain fruit to the light, elegant aromas of its more fog-laden vineyards.